Confession: We love a good party dress, and will stop at nothing to find the perfect look. Illusion, sequins, fun fit and flare skirts; seriously we could go on for hours. Not to mention, we love playing the part of a stylist any chance we can get. With all the invites you have, piecing together an ensemble may have slipped your mind…Whether you find yourself as the guest of a wedding, graduation party, or other semi-formal event, we’ve rounded up 5 fun party dresses with accessories fit for any summer soiree. The definition of “party dress” lies in this festive fit and flare style! The plunging neckline and drawn-in waist make it flattering on all shapes, while the mesh panels and glitter dot print add bits of flirtacious flair. Elevate the look with strappy heels and a gold glitter clutch. This LBD = perfect for your next RSVP. 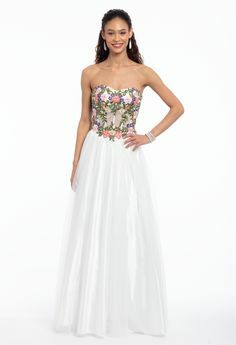 Beautiful for graduation or an outdoor wedding, this tiered floral cocktail dress is ready for summer! Appear picture perfect as you chat with the crowd in this whimsical floral print bearing a strapless neckline. Complement the style with gold heels and a pink clutch. The dance floor called, and it’s begging you to take center stage in this red party dress! Put your moves on full display as you tap your toes in sparkling gold heels that gorgeously complement this figure flattering style. The final finishing touch? A dazzling gold clutch. What’s calm, cool, and effortlessly chic? YOU in this pretty periwinkle dress! The racer cut back is super flattering on shoulders, while the slim fit hugs curves to perfection. Complement the cool peri tone with a silver clutch and heels. Truth: we’re loving this as a wedding guest dress for spring. Take it to the edge with an off the shoulder evening dress for your next semi-formal event! A vivid fuchsia hue stands out in the most elegant way, and the midi length draws eyes to your sleek legs. Keep accessories just as sophisticated; a simple brooch clutch and shining heels are the epitome of classy. Pinkies up!